What is a bar? The answer seems straightforward – until you experience something that turns all preconceived notions on their proverbial head. Welcome to Hong Kong, J.Boroski. Named after owner Joseph Boroski, this new Central bar is, well, not really a bar. 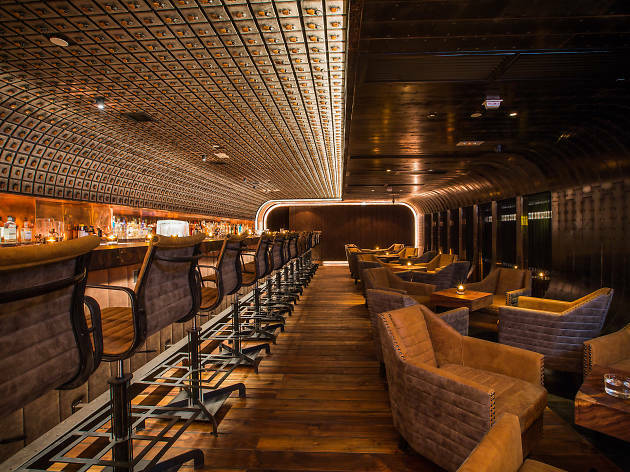 It technically is, of course – inasmuch as drinks are ordered and consumed on-site – but this ‘creative cocktail space’ goes above and beyond what a bar, however superlative, offers. For starters, this invitation-only space has no listed address and also no menu. 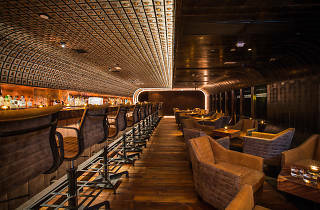 It’s a formula that’s already seen success at J.Boroski Bangkok, which, upon opening in 2014, quickly became one of the most sought-after seats in town. As with the Thonglor original, the local incarnation has been designed by Boroski’s long-time collaborator Ashley Sutton, of Ophelia fame. Dark, dramatic and spacious, the room’s focal point is the curved ceiling, half of which is tastefully adorned with large rhinoceros beetles forming a mesmerising display over the spotlit bar. Providing a ‘concierge service’ to guests means that drinks are tailored to your tastebuds – to order is to answer a series of questions about your unique preferences. Strong or mild? Sweet or sour? Floral? Herbal? Spicy? Plus, you pay for the liquor and the rest is added for free. A tequila-based tipple ($150) uses clove and leather-imbued Excellia Blanco – we order ours floral and spicy, and get the perfect balance. We then request a herbal, smoky, whisky-based number and find that this too is exactly what we want. The Sheep Dip Islay malt ($170) is the perfect base for a drink that’s smoky on the nose, with a herbal kick that enhances the playful peatiness of the spirit. In getting exactly what you want every time, each sip tells a story. We’d tell you what to order but that’s not the point – the drink is yours and yours alone. And herein, we fear, might lie the only problem with J.Boroski: while Bangkok is known for outside-the-box thinking, this isn’t exactly Hong Kong’s strongest suit. Not everyone may ‘get’ what this bar is about. But those who do will feel like they’ve unlocked a world of cocktails they probably never knew existed – and it’s this part-exploration, part-education that will make each visit feel like its very own adventure. And, truly, unlike anything Hong Kong has ever seen. To request an invitation and to find out the exact location, call 2603 6020 or email hk@jboroski.com.